BASSETERRE, ST. KITTS, AUGUST 5TH 2005 (CUOPM) – A European-Caribbean consortium of eight private investors or their representatives, has expressed interest in constructing hotels and villas around the 18-hole La Valle International Championship Golf Course on the north-western side of St. Kitts. “It would be a long investment which needs to be well thought out. We would like to make this type of project that is well suited to St. Kitts and Nevis and the Caribbean region taking into account the heritage and culture of St. Kitts,” said Ralph Monplaisir of the Martinique-based Monplaisir Group. St. Kitts and Nevis Prime Minister and Minister of Tourism, Dr. the Hon. Denzil L. Douglas welcomed the Group during introductory and preliminary discussions on Thursday and expressed thanks to the investors for indicating an interest in the continued development of the Federation. “We do not want our people to feel excluded or be excluded. We want our people to feel included, not as just as employees, but as stakeholders and be a part of the development,” Minister Skerritt told the potential investors. Mr. Monplaisir said the company's master planner, Mr. Pedro Ray and an environmental engineer are to return to St. Kitts in two weeks time and a proposal will be submitted to Government in November. Chairman of La Valle Greens Ltd, Mr. Oswald Martin; Chairperson of the Frigate Bay Development Corporation and Acting Financial Secretary, Mrs. Janet Harris and Chairman of the Whitegate Development Corporation, Mr. Thomas Williams, gave brief presentations on the role of their respective institutions. Other persons in the group were Mr. Iain Monplaisir of the Monplaisir Group; Head of the European Property Investment for aAIM Group Plc., London-based Mr. Staurt Le Gassick; Director, Partner for aAIM Group Plc., Mr. James Elton; Ernst and Young (Luxembourg and Brussels), Italian-based Mr. Damaiano Nesi; Barbados-based AIC, Mr. Kip Thompson and Chairman and owner of Ray International in Puerto Rico, Mr. Pedro Ray. 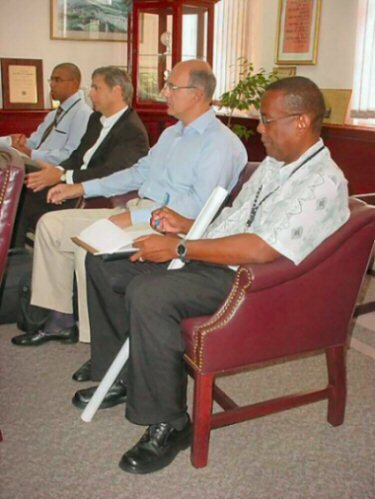 Senior Physical Planning Officer, Mr. Patrick Williams and Press Secretary to the Prime Minister, Mr. Erasmus Williams also attended the meeting, chaired by Prime Minister Douglas. The Monplaisir Group operates the Club Med in Martinique and will soon operate a Marriott-flag hotel also in Martinique. 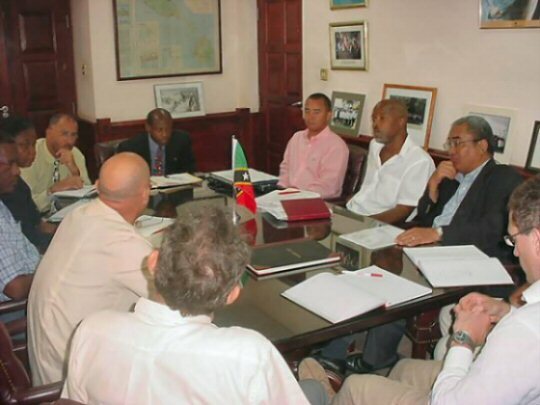 The development of the international golf course in Sandy Point, as part of the Whitegate Development Project, is important to the overall economic development of St. Kitts and Nevis. The project involves the construction of a marina, hotel resorts and commercial and residential complexes. The golf course and driving range will be on 220 acres. 50 acres has been set aside for the future development of the course to 27 holes. The hotels/resorts complex will be on 18 acres; the marina (10 acres); commercial complex (3.5 acres); residential complex (18.3 acres) and 8 acres have been set aside for a future sports complex. The La Valle Greens Limited is a joint venture between the Whitegate Development Corporation and the Frigate Bay Development Corporation. Photo 1: (Clockwise) - St. Kitts and Nevis Prime Minister and Minister of Tourism, Dr. the Hon. Denzil L. Douglas; Visit Co-ordinator, Mr. Charles Jong; Chairman of La Valle Greens Ltd, Mr. Oswald Martin; Barbados-based AIC, Mr. Kip Thompson; Head of the European Property Investment for aAIM Group Plc., London-based Mr. Staurt Le Gassick; Chairman, Monplaisir Group, Ralph Monplaisir; Mr. Iain Monplaisir of the Monplaisir Group; Chairman of the Whitegate Development Corporation, Mr. Thomas Williams; Chairperson of the Frigate Bay Development Corporation and Acting Financial Secretary, Mrs. Janet Harris and Minister of State for Tourism, the Hon. Richard "Ricky" Skerritt. Photo 2: (left to right) - Financial Controller, Monplaisir Group, Kendeau Pelle; Chairman and owner of Ray International in Puerto Rico, Mr. Pedro Ray; Ernst and Young (Luxembourg and Brussels), Italian-based Mr. Damaiano Nesi and Senior Physical Planning Officer, Mr. Patrick Williams.